Originally founded in 1871, Columbian Home Products is the oldest cookware manufacturer in the U.S., famous for producing Porcelain on Steel cookware. Granite Ware has a carbon steel core for strength, conductivity and superior heat distribution. Porcelain is fused to the steel at 2,000 degrees Fahrenheit producing a non-porous, inert glass surface that is naturally non-stick. There are no PTFE’s, PFOA’s or any other chemicals to change the taste, color or nutritional value of the food. Porcelain can chip if dropped, however this does not reduce the effectiveness of the cookware. 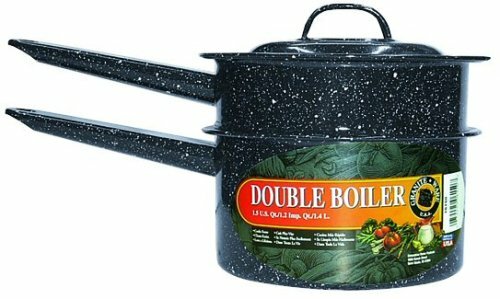 This 1.5 quart double boiler is perfect for steaming veggies. Not recommended for glass cooktops. Black. Not recommended for glass cooktops.